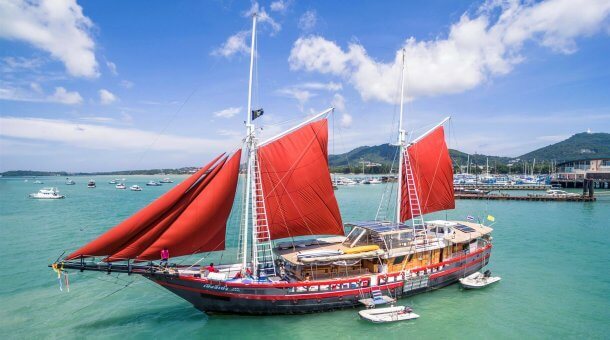 Moana is a classic 30m Phinisi Schooner, able to take up to 12 passengers for charter (maximum 10 divers on regular trips) for diving or cruising in the Komodo region. All cabins have airconditioning and en suite bathrooms. Although built in a traditional style, Moana is a stylish and modern vessel, launched in 2004 and totally refitted early in 2015. 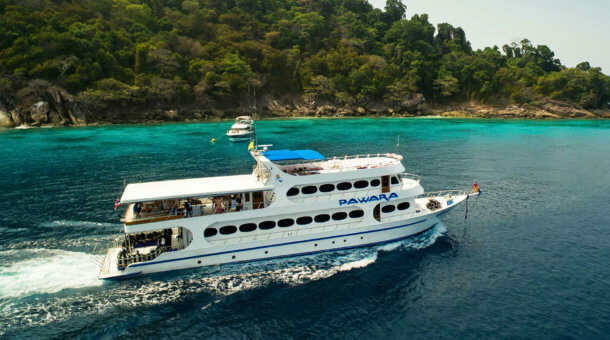 You can dive or cruise around the islands of Indonesia in comfort. 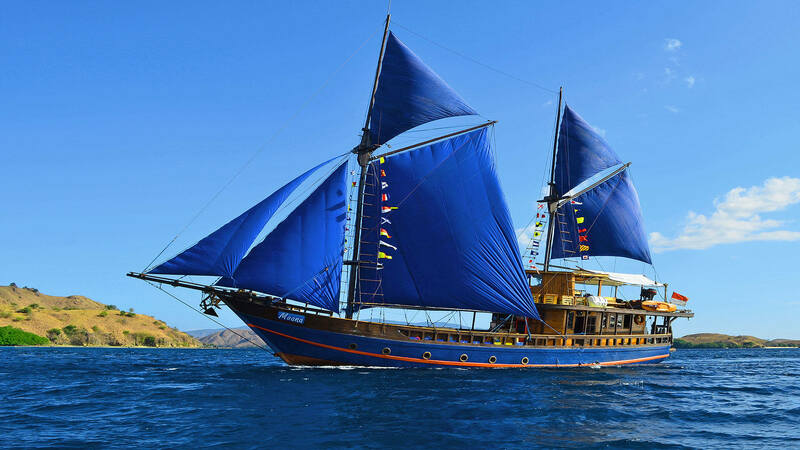 Moana is also attractively priced for a charter group - ask us about diving charters in Komodo! Early Booking Offer : Book for 2020 and 2021 before 30th April 2019 and receive the 2019 price. Moana - Time to Eat! Moana combines the traditional and the modern to give you an unforgettable cruise through the islands of Indonesia. Trips run in the Komodo National Park departing from Labuan Bajo (Flores Island). The most popular are the short 4 or 5 night trips which run from Flores. The good price makes them ideal for divers who want to dive Komodo but have limited time. All trips all include a “walk with the dragons” – a chance to see Komodo dragons. 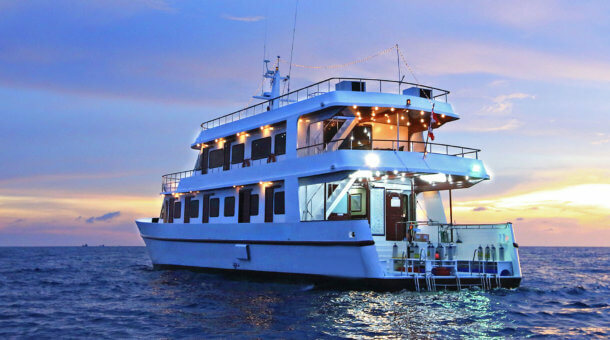 The boat is also ideal for charters, if you have a group of divers or you can also charter for just cruising and snorkeling in Komodo and the surrounding area. 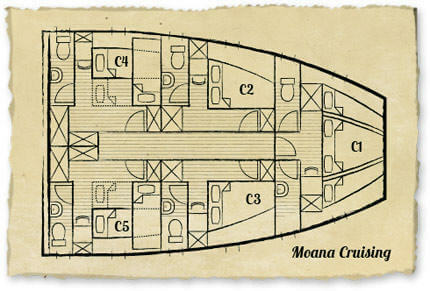 There are 5 cabins on Moana, all below decks – three double bed, and two twin bed. The maximum capacity is 12, but she can take only 10 divers maximum. All cabins are en suite. Moana is built from teak and ironwood, which lends a warm and comfortable air to the boat. The upper deck offers a huge amount of space. There is an air-conditioned indoor salon and a lot of deck area to relax. On deck you find a big spacious dining table with romantic indirect lighting. For outdoor lovers the boat offers blankets to sleep on deck watching the stars. Moana sources vegetables and fruits from organic farmers from the hills around Labuan Bajo, fresh fish from the local market. Meat and oven fresh bread is flown in from Bali every week. All best quality and guaranteed free from MSG and other Asian flavor enhancers! A day on board starts with a healthy breakfast before diving. Fresh fruits according to the season (papaya, mango, pineapple, melon), cornflakes, oats, local honey and more is waiting for the early birds. After the first dive, the “big breakfast” will be prepared. This may include omelets, pancakes, breakfast sausages, ham and bacon as well as fresh farmers bread and toast. Buffet style – all you can eat! Lunch and Dinner varies from Western, Indonesian, International and Asian specialties as the cruise goes on. This good mix of Asian and Western food caters for all tastes. 2 courses for lunch and 3 courses for dinner (soup/salad, main, dessert) are served. The portions are suitable for hungry divers! Rental equipment is provided on board the Moana liveaboard. Any rentals you need, please book in advance. Rental rate 200 Euro per trip for a set (BCD/regulator/wetsuit/dive computer/mask/fins). Dive torch 25 Euro per trip. 15 liter tanks no charge, but need to be booked in advance. Nitrox is not available on Moana. Moana runs trips from March to December in Indonesia, mostly in the Komodo area. Most trips are either 4 or 5 nights. We can provide itineraries on request for any trip in the schedule. DEPARTURE DAY Flight from Bali – LBJ at about 8 – 9 am. Arrive Labuan Bajo. Welcome aboard Moana, waiting for you in the harbour of Labuan Bajo. Pick up can also be arranged from Labuan Bajo hotels. After a refreshing welcome drink, Moana will set sail. Check-out dive in the afternoon and a night dive too. Dinner and overnight north of Komodo. DAY 2 Morning dive: Crystal Rock. After breakfast depart for a dive at Castle Rock. The rock is packed with bronze and rust colored sponges and soft tree corals. You may see black snappers, large cuttlefish, pyramid butterfly fish, and red octopuses. Later in the afternoon you can climb the local summit and enjoy a splendid panorama over the moon-shape islands of the Komodo Archipelago and the mainland of Flores. Afternoon dive at the light house in the north of Komodo. Also a night dive at Gili Lawa Passage. DAY 3 Morning dives: Current City (Batu Bolong) and Tatawa. Thousands of fish of every colour and shape are here including regal angelfish, checkerboard wrasse and masked unicorn fish, against a beautiful backdrop of acripora corals, gorgonian fans and sponges. In the afternoon we dive Manta Point or Pink Beach and there may also be a night dive. DAY 4 Exploring Komodo – there are plenty of dive sites in the Komodo area – note that this itinerary is just a guide. Sites will be selected based on water conditions and weather to ensure you get the best dive sites possible. DAY 5 This morning we dive again at our favorite spot, Current City. While enjoying a wonderful breakfast, we sail towards Rinca, relax and enjoy the great views. Look out for dolphins! Another dive at Pulau Tengah (Little Batu Bolong) our new secret hot spot! In the afternoon a chance for a Dragon walk to see the infamous Komodo Dragons. ARRIVAL DAY AAfter breakfast, time to move Moana back to Labuhan Bajo. At ca. 10 o’clock in the morning you will be transferred to your hotel or the airport where your airplane to Bali is waiting for you. Note : This is an approximate itinerary. 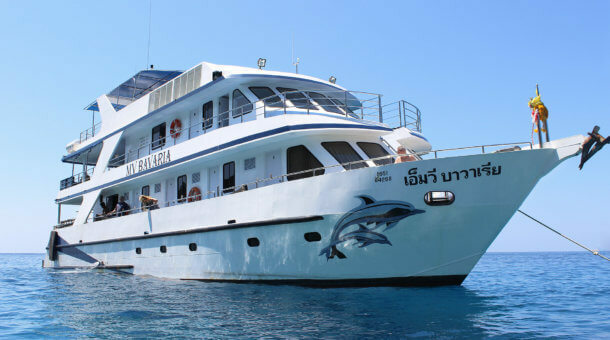 The 5 night trips include about 16 dives. Exact dive sites will vary from day to day.